Back in the days before cell phones were common my car broke down on a lonely stretch of highway in Michigan. It was very late at night. I sat there for 20 minutes and no other cars passed me. I decided to write a note as to the direction I was walking so that the search parties would have a good chance of finding my unconscious body. Just as I finished writing the note a tow truck stopped to help me. I always felt lucky that the first person to stop was someone that could genuinely help. Is everyone sleeping in on the holiday?? 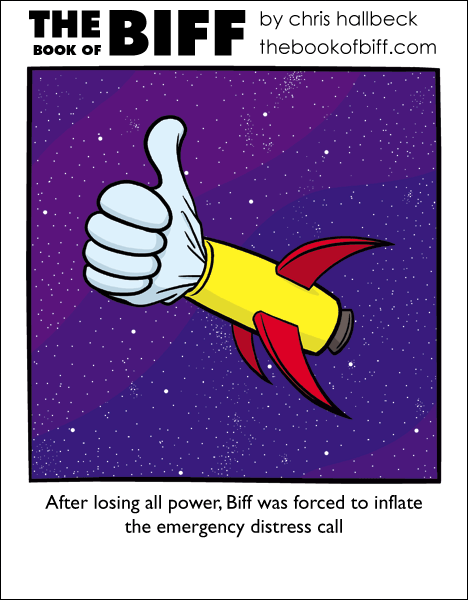 Hopefully, Biff will have the same luck as you. Then again, Hes always survived strange things, Why not no air? I’m sure the man could handle it .-. Return of the Rocket! Again! It’s trademark! Great update to celebrate Towel Day! Biffs rocket is back in action! I’m going to go ahead and assume jenny is right with “book references week”, but I would dearly love an entire Hitchhiker’s Guide week. Towels, restaurants, time travel, impossible odds, and overall just a generally good romp. If I were to make an emergency distress signal, it would be a giant neon sign. Or, if it had to be a hand, a pink one. A gray hand doesn’t scream “EMERGENCY” to me. much less one that appears to be giving the thumbs up all ok hand sign thing. Just don’t get picked up by Vogons. Lawl, Hitchhiker`s Guide to the Galaxy week! And today is Towel Day! I can’t be certain what week it is just by one comic, but book titles week would be awesome. I’m gonna guess Biff comics without Biff actuallly appearing. That I believe is enough guesses! Getting lost is not that hard for me…I have trouble finding people in my own house! I have two more guesses that I can’t believed i missed! The funny thing is that in outer space, with no orientation that could very well be a thumbs down lol…. HitchHiker’s Guide to the Galaxy FTW! Why not? My rocket has a distress call just like that. Wait that is my distress call! Biff stole my rocket!!! On Friday, I realized I had lost a day somewhere. I’m so glad I’m not the only one who saw hitchhikers in this picture.